This book is set just before the end of Star Wars: Episode III: Revenge of the Sith. Telling the story of how Clone Wars General and Jedi Master Obi-Wan Kenobi descended into the guise of the "crazy old wizard" Ben Kenobi. With a very western feel set on a desert planet, this works very well in favor of a small tale instead of a massive galactic conflict as so many other Star Wars stories tend to do. It starts with the arrival of Kenobi on Tatooine looking to deliver the infant Luke Skywalker to the farm of Owen and Beru Lars. Then, quite nicely it jumps to a bunch of other people and leaves Kenobi to be almost a supporting character, with Annileen the shopkeeper and Orrin Gault the farmer almost taking the reigns completely. Kenobi conveys a wonderful sense of the devastation caused by Obi-Wan's actions in Revenge of the Sith. He's a broken Jedi Master that has lost everything- friends, colleagues, and his Jedi way of life- but still feels the call to help others. It is made more difficult due to circumstances constantly arising around him as he tries to withdraw from the world. Much in the way of an old Clint Eastwood film, Obi-Wan is a stranger come to town, and aids them in ways they couldn't have done. Moisture farmers and shop owners alike receive his assistance and never once does he ask for anything in return. He has to find balance while maintaining his newly necessary reclusive nature- the struggle to move on from the emotional impact of loss and the drive to help. Remaining an anonymous hermit is near impossible with gossipy small pioneering town of Oasis. One thing I really liked from this book was the character A'Yark, the Tusken Raider. It is quite interesting to get to see things from the point of view of these people. A simple warlike tribal society being driven to extinction. A'Yark is attempting something no other Tusken has done- to help the tribe grow, to bring others together because their current way of life is failing. The simple act of changing generations of ingrained Tusken tradition for A'Yark is quite daunting, but managed with cleverness over time. While I'm typing this I would like to say that the end feels a bit too big. Too many neatly wrapped up threads. There is just something a bit bothersome about it. Honestly, I was surprised Obi-Wan didn't walk off into a sunset after a small final confrontation. So if you like Star Wars or westerns, the book is simple, but entertaining. With nothing unpredictable it remains a good read. Note: I listened to the Audiobook version of Kenobi by John Jackson Miller and read by Jonathan Davis. 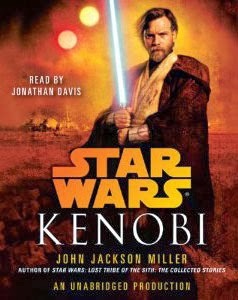 I will say I prefer the Star Wars audiobooks because it really is like listening to films- there's tons of added sound effects and many of the readers do pretty damn good impressions of the characters- Davis does a great Ewan McGregor version of Obi-Wan.